Over 90 FREE books Potpurri-style! You are here: Home / Events / Over 90 FREE books Potpurri-style! Greetings fans of instaFreebie giveaways! 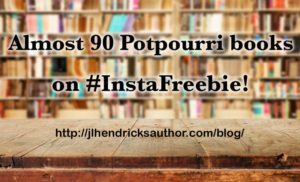 Here’s another fantastic #instaFreebie promotion that includes over 90 ebooks across a whole bunch of genres. It’s an excellent opportunity to grab books that interest you & ones that you might not have tried otherwise. These are all risk-free, just sign up for the author newsletters and get to know the authors and the books they write. You might just find a new favorite! Enjoy & happy reading always!